Are you tired of squeezing in your life around your work? Why not design your work around your lifestyle instead? 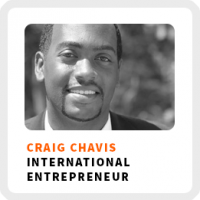 Craig Chavis shares loads of ideas on how to design your lifestyle around work you love. He’s a serial entrepreneur, really a socially-minded entrepreneur. He’s served in the Peace Corps, started a business aboard and is a globetrotter. His latest startup Visajump is an app to help travelers manage their travel documentation more easily and effectively as they travel the globe. How Craig started the first craft distillery from scratch in Peru. He shares his advice on raising money for your startup without hitting up your family and friends. Why he says don’t quit your job without a plan for how you are going to build your business. Don’t go out into the world to prove what’s right with your business, prove what’s wrong with it to make it better using the scientific method. How to build your business while you are working a full-time job. Why you need a board of advisors. Wake up time: Between 5:00 and 5:30am. Core work activities + habits: 1) Plan out the week every Sunday with the co-founder. 2) Meet and execute on the plan on Monday. 3) Attend the accelerator events and meetings with investors and mentors. Ideal work environment: Early in the morning in a relaxed, open environment. Regains focus by: Working out, using a lot of energy in the right way. 90-day goal: Get the pitch, business model, and customer discovery process down pat in order to raise capital and build an MVP. 1) Don’t waste it. Be intentional about planning how and why you’ll use that time. 2) View your time as a tool and find ways to wield it effectively. Get early access to Visajump by signing up here!